[Episode #72] Over the month of February, we're going to dive deep into leveraging the Facebook Pixel and tracking conversions that really matter. In the past we've talked about what the Pixel is, and how to install it [find a refresher here]. Today we're going to take things a step farther and talk about tracking actions that happen after the user arrives on the site… optimizing for conversions with Standard Events. Standard Events are the tech'ier option… if you are not super techy, I encourage you to listen anyhow. Even if you opt to use the less techy Custom Conversions that we'll talk about next week – it's important to have a basic understanding of why they are different and how they each work. Standard Events currently include 17 specific actions that Facebook recognized most advertisers were using… things like Add to Cart, Complete Registration, Lead, Purchase, and View Content. Just as the pixel is a snippet of html coding, so is a standard event. The difference is that the base pixel is installed in the header of your website (so that it fires on every page) whereas the Standard Event is installed on the page that the user lands on AFTER a conversion takes place. So, for example, a Purchase conversion would be installed on the thank you page the user lands on AFTER completing their purchase. If you want to track how many people begin the check-out process you can install an Initiate Checkout pixel on that page. Creating audiences of people who have taken specific actions. Using standard events you can create an audience of people who have Viewed Content on your website, and an audience of people who have completed a Purchase. Then, you can run an ad to people who have Viewed Content but NOT Purchased — so that you retarget exactly the people you want to see you ad! You can also use these audiences to create Lookalike Audiences of your best performing audiences – so a Lookalike Audience based on the people who have purchased from you will likely be stronger than a Lookalike Audience based on anyone who hit your website (since not all those people stuck around to become a customer). Tracking more in depth analytics. We will dive into this section in a couple weeks, but basically, this will allow you to make more educated decisions about your ad performance, and understand your customer journey (troubleshooting your funnel if needed). 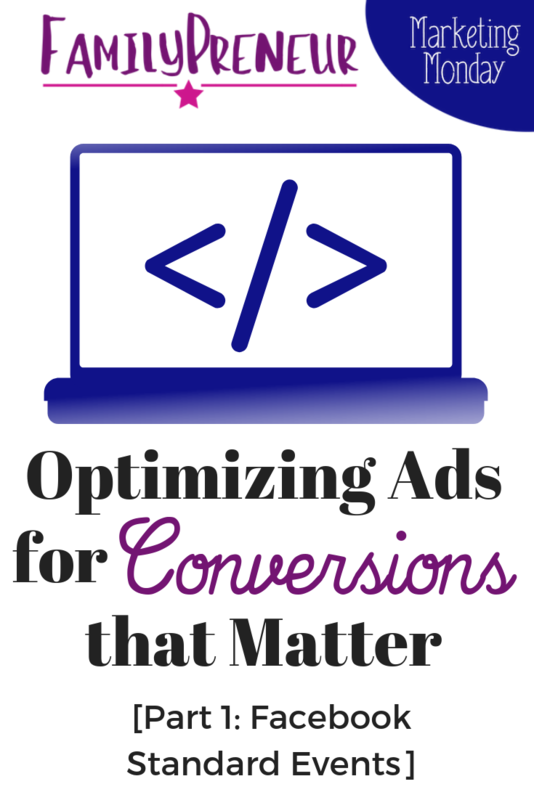 Optimizing your ads for the conversions that matter most to you! Once you have set up your Pixel with Facebook Standard Events, you will be able to choose the Conversions Objective so that you can optimize your Ad Delivery to get more of the conversions you actually want. Many times, I have clients who were running traffic ads because they wanted to drive traffic to their website, where they could then purchase their products… what they REALLY should be doing is running Conversion Ads to not only drive traffic to their websites, but to get the leads/purchases that will directly impact their revenue. The way the Ad Algorithm works is that Facebook considers your objective and optimization goals when determining who to show the ads to… so if you run a Traffic campaign, Facebook knows #1 what people are most likely to click on a Traffic ad… and #2, Facebook will analyze the people who are clicking so that it “learns” who of THOSE people is clicking – then optimize your delivery appropriately. If you switch the objective to conversions, you will see better results because Facebook will show your ads to the people most likely to take THAT action. Remember: Facebook WANTS you to be successful – so it's intentionally designed to be an amazing powerhouse, allowing you to target your ideal client with precision so that you can generate a Return On Investment that you'll want to REinvest in Facebook Ads. Because it's so intricately designed, it can be confusing… which is why I encourage you to subscribe to this podcast, and join the FREE FamilyPreneur Community. I really love helping other business owners have their “ah-ha” moments, where Facebook marketing finally CLICKS and they can take back their time and leverage the Facebook platform for the robust marketing tool that it is! « Podcast Cover Art: Where Is The Fourth kid?